The health of your child is the most important thing to consider when you are a parent. Whether you just welcomed a new addition to the family or you have a teenager, it’s important that they get the proper medical care they need to grow up healthy, happy and strong. We know you want to give your children the best, and here at 7 Days Pediatrics we believe in providing only the very best pediatric services to children of all ages. 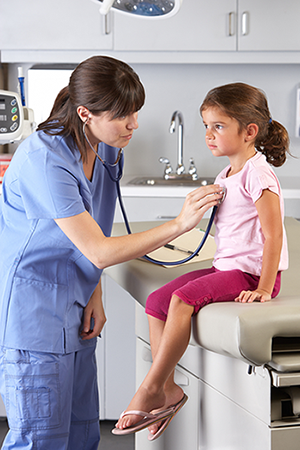 Even if your child is healthy, it’s important that all children visit us once a year for routine checkups. Why are these checkups so vital for my child’s health, you might be wondering? First and foremost, it’s important that you have a pediatrician on your side that you can trust to provide your children with the proper care they need while also offering up support and advice to parents. These routine visits are important not only for your child’s physical well-being but also their mental and emotional health, as well. We think parents agree that it’s much better to provide their growing children with the optimal care they need to prevent diseases from happening rather than waiting until a problem arises to treat it. The pediatricians at 7 Days Pediatrics believe prevention is everything. By making sure your child comes in routinely we can provide them with the immunizations they need to protect them against potentially life-threatening infections. Your child is growing by leaps and bounds but it’s also important that we track this progress to make sure that they are meeting all these necessary milestones. By bringing in your child regularly to see our pediatricians, we can catch developmental delays early on when they can be much easier to tackle in the beginning stages. Of course, these visits are also great for you, the parents. While these checkups are crucial to your child’s health this is also a great time to address any concerns you might have or ask any questions regarding your child’s health and lifestyle. This means talking to us about everything from developmental and behavioral issues they are displaying to asking about their diet and exercise routine. We know that parents have enough on their minds, so having a pediatrician with which you’ve already established great rapport is truly an invaluable asset to your family. We hope you agree! If it’s time to schedule your child’s next trip to the pediatrician, then it’s time to call 7 Days Pediatrics at (732) 548-3210. For more information on our Pediatricians, call 7 Days Pediatrics in Fords & Perth Amboy at (732) 548-3210!